Packing pads can be used to fill the gap between the air poles and the caravan to create a more taut roof and help shed water. They are ideal for use when your awning is fitted to a roll-out/cassette type awning. Struts that are against my caravan in weather conditions good idea ,not that I have any problems with this but it always pays to just to be sure. I can't believe how much difference they make to the fit of my awning. 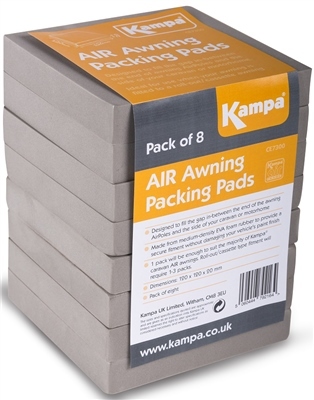 They are made by Kampa but I use them with my Sunncamp Air Awning and they fit perfectly. I can't believe how much difference they make to the fit of my awning. They are made by Lamps but I use them with my Sunncamp Air Awning and they fit perfectly. Great price. Easy to order through the web site. Arrived as stated on time.